The demand in the global zinc dialkyl dithiophosphate (ZDDP) additives market is expected to increment at a CAGR of 1.6% during the forecast period of 2017 to 2025, primarily driven by the prosperity of the automotive sector. ZDDP is an anti-wear additive used to provide high performance in the engine and gear oil. It improves the corrosion protection against metal surfaces thereby augmenting the life of engine and components. 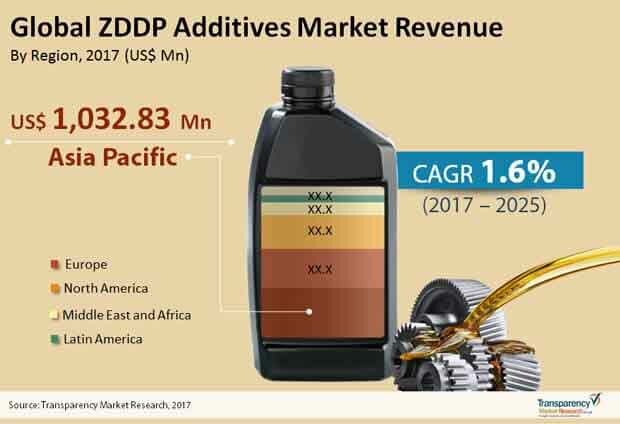 The valuation of the ZDDP additives market is projected to raise from US$2,717.82 mn in 2017 to US$3,085.79 mn by 2025. Based on product, the global ZDDP additives market has been segmented into primary alkyl ZDDP and secondary alkyl ZDDP. The relative effectiveness of ZDDP as an antiwear agent and its thermal and hydrolytic stability depends upon the alcohol used during its preparation. Primary alkyl ZDDP offers better thermal stability but are less effective in terms of antiwear protection and hydrolytic stability. Whereas, secondary alkyl ZDDP provides better hydrolytic stability and are effective antiwear agents. On account of these properties, secondary alkyl ZDDP, dominated the market accounting for more than half of the revenue market share in 2016. Secondary alkyl ZDDP, due to its low thermal stability resulting in quick film formation under high loads are preferred choice for extreme pressure applications. However, primary alkyl ZDDP because of its better thermal stability are used in hydraulic fluids as an antioxidant and antiwear agents. In terms of end use, ZDDP additive market is bifurcated into automotive and industrial. It is widely used in automotive sector in all engine oils, and the segment dominated the market in 2016, accounting for more than 80% of the revenue. This can be ascribed to the multifunctional characteristics of ZDDP. For instance, it is employed as an anti-wear agent, mild extreme pressure agent, and oxidation and corrosion inhibitor. ZDDP operates under mixed lubrication conditions with a thin oil film separating the metal parts in automotive applications such as engine and components. In industrial segment, industrial gear oil formulators have shifted towards ashless systems incorporating sulphur-phosphorous based extreme pressure antiwear chemistries. Hence the industrial sector only accounted for marginal market share and is expected to grow at a modest CAGR during the forecast period. Geographically, Asia Pacific was the dominant region in the global ZDDP additives market in 2016, accounting for approximately 40% of the revenue. This was a reflection of the increase in motor vehicle output, strong demand for aftermarket lubricants, and expansion in the manufacturing sector in the emerging countries such as China and India. In terms of country level, China is the largest producer and consumer of ZDDP additives in the word. The country held significant share of the ZDDP additives market in Asia Pacific in 2016. Rise in disposable income in countries such as China and India has boosted the demand for automobiles. This, in turn is expected to propel the consumption of ZDDP additives. North America and Europe are mature markets for ZDDP additives due to the implementation of stringent emission norms on the phosphorous level of ZDDP. Afton Chemical Corporation, Chevron Oronite Company LLC, Infineum International Limited, ZPlus, LLC, AMSOIL, Mukund Anderson Inc., Rislone CamGuard, and Prasol Chemicals Pvt. Ltd. are some of the prominent companies currently operating in the global ZDDP additives market. This report analyzes and forecasts the market for ZDDP Additives at the global and regional level. The market has been forecast based on revenue (US$ Mn) & Volume (Tons) from 2017 to 2025. The study includes drivers and restraints of the global ZDDP Additives market. It also covers the impact of these drivers and restraints on demand for ZDDP Additives during the forecast period. The report also highlights opportunities in the ZDDP Additives market at the global and regional level. The report comprises a detailed value chain analysis, which provides a comprehensive view of the global ZDDP Additives market. Porter’s Five Forces model for the ZDDP Additives market has also been included to help understand the competitive landscape in the market. The study encompasses market attractiveness analysis, wherein end-user are benchmarked based on their market size, growth rate, and general attractiveness. The study provides a decisive view of the global ZDDP Additives market by segmenting it in terms Product and end user. These segments have been analyzed based on present and future trends. Regional segmentation includes the current and forecasted demand for ZDDP Additives in North America, Europe, Asia Pacific, Latin America, and Middle East & Africa. The report also covers demand for individual end-user segments in all the regions. The report provides the estimated market size of ZDDP Additives for 2016 and forecast for the next nine years. The global market size of ZDDP Additives has been provided in terms of revenue and Tons. Market numbers have been estimated based on product, and end user segment. Market size and forecast for each product and end user have been provided in terms of global and regional markets. In order to compile the research report, we conducted in-depth interviews and discussions with a number of key industry participants and opinion leaders. Primary research represents the bulk of research efforts, supplemented by extensive secondary research. We reviewed key players operating in the boiler and various end user industries, annual reports, press releases, and relevant documents for competitive analysis and market understanding. Secondary research also includes a search of recent trade, technical writing, internet sources, and statistical data from government websites, trade associations, and agencies. This has proven to be the most reliable, effective, and successful approach for obtaining precise market data, capturing industry participants’ insights, and recognizing business opportunities. Secondary research sources that are typically referred to include, but are not limited to company websites, annual reports, financial reports, broker reports, investor presentations, and SEC filings, internal and external proprietary databases, and relevant patent and regulatory databases, national government documents, statistical databases, and market reports, news articles, press releases, and webcasts specific to companies operating in the market, American Petroleum Institute (API) , International Lubricant Standardization And Approval Committee (ILSAC), The Japanese Engine Oil Standards Implementation Panel (JASO), Association of European Automobile Manufacturers (ACEA), European Chemical Agency (ECHA), Registration , Evaluation, Authorization and Restriction of Chemical Substance (REACH), Petroleum Additive Manufacturer, Environmental Protection Agency. The study includes profiles of major companies operating in the global ZDDP Additives market. Key players profiled in the ZDDP Additives market include Chevron Oronite Company LLC, Afton Chemical Corporation, The Lubrizol Corporation, Infineum International Limited, AMSOIL, Rislone CamGuard, ZPlus, LLC, Mukund Anderson Inc., Prasol Chemicals Pvt. Ltd. Market players have been profiled in terms of attributes such as company overview, financial overview, business strategies, and recent developments.